This is an original structure from Gordon Canyon which is 30 miles east of Payson on the Mogollon Rim. The structure was the home of William Gordon and his family, later converted to educational use after their family moved to Grapevine, Arizona. The school was in use from approximately 1885 to 1930. The original school records were lost when Gila County split off from Yavapai, so an exact date of construction was unable to be determined. 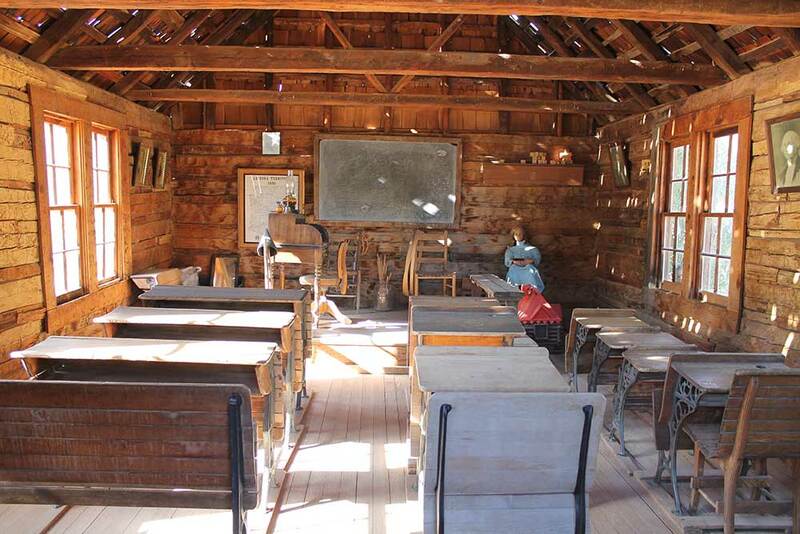 The interior depicts a typical 1890’s territorial school house. In 1890 all eight grades received their education in this one-room schoolhouse. School was in session from March through November, and classes were not held in the winter. William and Elizabeth Gordon arrived in Arizona in 1874 from Oregon. One son died during the move by covered wagon, leaving a son and five daughters. 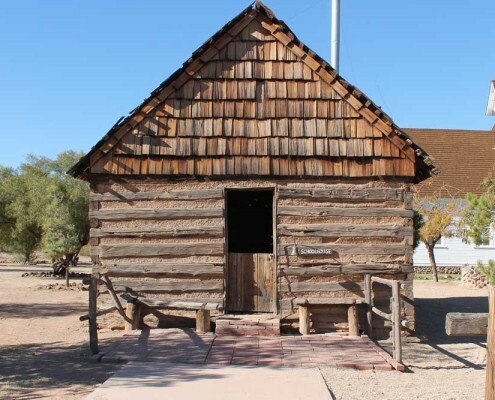 Research by the late Jess Haves, Gila County School Superintendent, shows that the buildings were first used by the Gordons for living quarters. The Gordons moved to Steamboat Rock or Grapevine above Roosevelt Lake in the 1880’s. 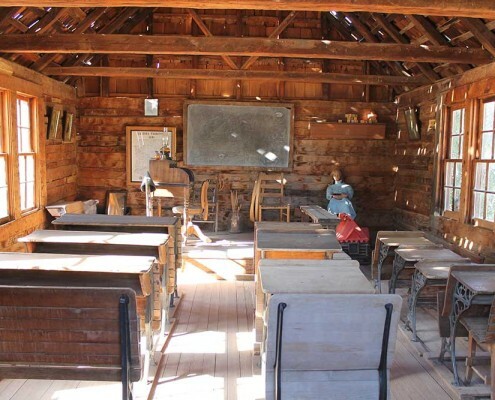 The school, teacherage, and cabin (Ranch Complex) from the Mogollon Rim are examples of the lengths Pioneer Arizona went to obtain and restore historic buildings. The buildings were moved from Gordon Canyon to Pioneer Arizona by the Arizona National Guard. Twenty, nine-foot logs were moved 150 miles using a tank-retrieving, 40-foot, lowboy rig to haul the logs from the Christopher Creek area. This was accomplished after Neighborhood Youth Corps enrollees camped out and marked each log and coded every nail hole and strip of chinking. A three-month search was conducted nationwide; until 7 adzes (a hoe-like, obsolete axe-like tool used to hand-hew the logs) were acquired to be used in hewing replacement logs. The construction features square-notch corners. 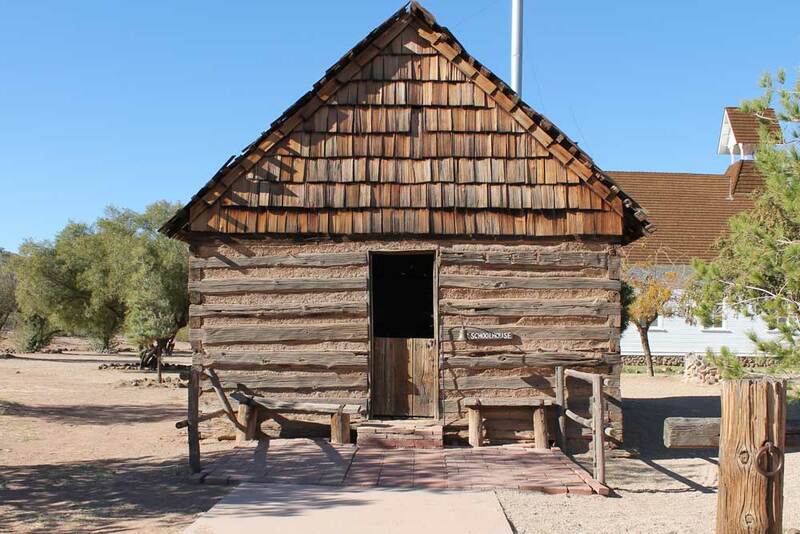 The schoolhouse became the first completely restored historical building at Pioneer Arizona, and a dedication ceremony was held on October 23, 1966. Funds for the restoration had been donated by the Washington Woman’s Club, who dedicated the school in the memory of Hattie Greene Lockette, a teacher, author, and founder of the Washington Women’s Club. On the day of the dedication, the motto of Pioneer Arizona Living History Museum was written on the blackboard: “Faith, Foresight, and Fortitude Equal Pioneer Spirit”.